Keith Millard was the ferocious face of the Minnesota Vikings from 1985 through 1990. This ex-Jacksonville Bulls defensive lineman tormented opposing quarterbacks for more than nine seasons in the NFL -- recording 58 career sacks in 93 games. Drafted by the Vikings in the first-round of 1984, Millard decided to play for the Jacksonville Bulls because the USFL offered him more money than Minnesta was ready to cough up. 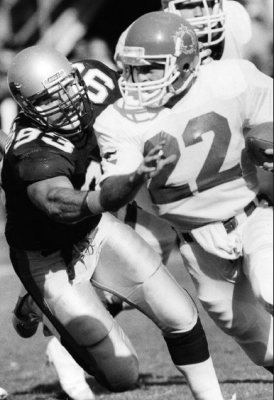 Millard recorded 12 sacks for the Bulls in '85, second only to Reggie White’s 12.5, which was a league-best. "Unbelieveable," is how he describes the talent in the USFL. "I don't care what anybody says, if I didn't have that experience that I had in Jacksonville, I don't think I would have been the player I was. That league was absolutely legit." under head coach Lindy Infante. Like many USFLers, Millard headed to the NFL after the '85 USFL season. Minnesota worked out a deal with their '84 No. 1 and the rest is history. Like many USFL refugees, Millard played a full 18-game schedule and went right into the heat of the NFL training camps that summer. The fatigue didn’t effect Millard’s performance; the former first-team All-Pac-10 defensive lineman led the Vikings with 11 sacks. In 1986, he followed his rookie NFL season with 10.5 bags of the quarterback. The Vikings’ defense now had a player that would make the Purple People-Eaters proud. In 1989, Millard switched from defensive end to tackle, where he set an NFL record 18 sacks for an interior lineman. Millard was selected to his third-consecutive Pro Bowl and was named Defensive Player of the Year. 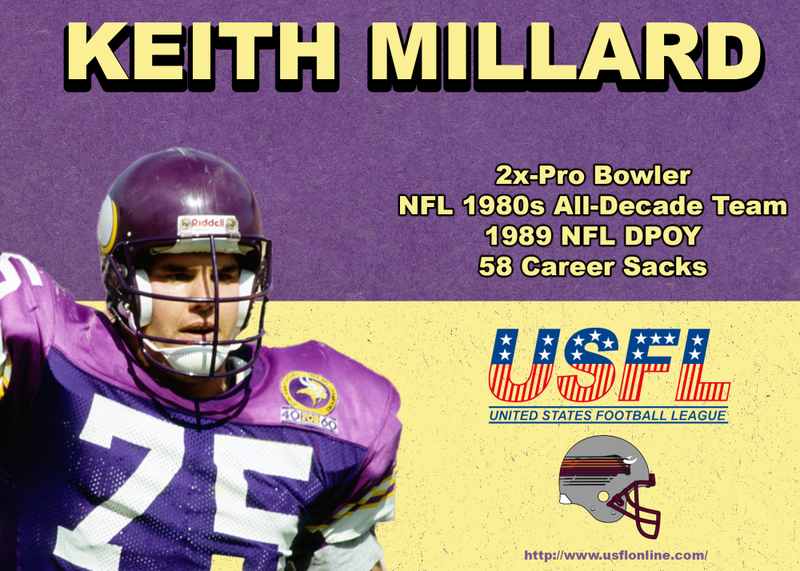 "Unbelieveable," is how Keith Millard describes the talent in the USFL. "I don't care what anybody says, if I didn't have that experience that I had in Jacksonville, I don't think I would have been the player I was. That league was absolutely legit."